1"150 BONUSES on your account" means that 150 bonuses are included in the price of a subscriber's initial bundle of services. 1 bonus gives a right to receive extra services totally priced 1 UAH. After the activation of the initial bundle, 30 days bundle of services will be provided, and the bonuses that amount to the price of a corresponding bundle will be charged from the account. The remaining bonuses can be used during 60 days starting from the moment of activation of the initial bundle and receiving bundles of services and some other telecommunication services. To learn more about the usage of bonuses, click here. 23000 min / month means 100 minutes per 1 day. 3000 min: 100 min x 30 days. After using within one day of 100 minutes of calls made from the BiP application through the BiP Out function, all subsequent calls from the BiP application through the BiP Out function during that day are made at the expense of 1000 minutes provided for incoming mobile calls to the 30-day package of services of the tariff plan "BOMBA". 31000 minutes for 30 days for calls to numbers of any Ukrainian operators (including lifecell) from mobile within 30-days package of services subscribers. A new amount of minutes will be provided after payment of the next 30-day service package. 4 Internet traffic, provided for 60 outgoing minutes made via BiP app with BiP Out option, is valid till the end of the 30-day service package duration in terms of which it was provided. 5100 MB BiP in roaming are provided with charging 30-day bundle of services for this tariff plan. For more details, click here. 6Free means that the access is provided towards the price of the 30-day service package. If the 30-day service package within its tariff plan is not paid, the provided/transmitted data by using social networks and messengers will be rated according to the terms of the tariff plan. You may use Facebook and messengers like Viber, Skype, WhatsApp, Telegram with no limit, with no extra pay and by not spending the package megabytes! For that you should use only official applications for tablets and smartphones, or mobile/web versions of social networks websites. 7 All Basic Subscriptions (fizy Basic, TV + Cinema + Basic 30, lifebox 50 GB, lifecell Magazines, lifeSport) are provided for FREE only if you pay a 30-day service package. 8 The PREMIUM service is available for subscription only to subscribers who are serviced on the terms of the "BOMB" tariff plan. The cost of the service with all taxes and fees is 50 UAH / 30 days. After ordering the service, the next cost of the 30-day package will be 200 UAH. When ordering the PREMIUM service, the subscriber will be able to activate the following subscriptions: fizy Premium, lifebox 500 GB, TV + Cinema + Premium 30. To disconnect the service, enter the combination *112#. After disconnecting the PREMIUM service and expiration of the paid 30-day service package, all premium subscriptions will be disconnected, after which the subscriber must independently connect the basic subscriptions in accordance with the terms of the "BOMB" tariff plan. The tariff plan with abovementioned terms is valid within the Ukraine. Providing of telecommunication services on the temporarily occupied territories and territories, where the governmental authorities temporarily or do not have full powers, can be limited or impossible due to the circumstances, which are beyond the operator's influence and control. 1. Purchase "BOMB" or "Universal" starter package in our web shop, any of lifecell shops or partners' shops. 2. Buy any starter package in our online store or in the stores of the lifesell, or partners. 4. A link to the site will be displayed in the SMS, where you can download TV +, lifebox, fizy, lifecell Magazines, BiP, lifeSport and activate subscriptions by clicking the "ORDER" button. 5. Fill in the account for the amount of 150 UAH. 6. Take advantage of the "BOMB" tariff plan! 2. A link to the site will be displayed in the SMS, where you can download TV +, lifebox, fizy, lifecell Magazines, BiP, lifeSport and activate subscriptions by clicking the "ORDER" button. 3. Fill in the account for the amount of 150 UAH. 4. Take advantage of the "BOMB" tariff plan! Do you experience difficulties with switching to the “BOMB” tariff plan? If you’re a lifecell subscriber, please make sure there are enough funds on your account – 150 UAH or 200 UAH (with PREMIUM service) to switch to the tariff and if the previously ordered paid subscriptions to fizy, lifebox, TV+, lifecell Magazines are deactivated. How to activate subscriptions and services? 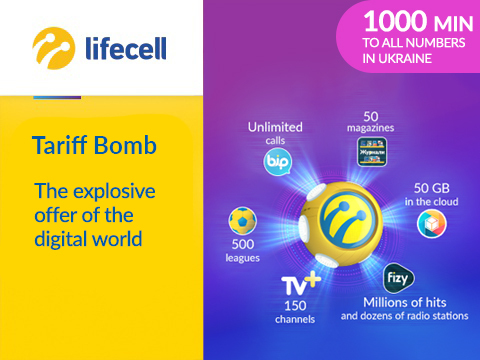 To activate fizy Basic, TV+ Cinema Basic, lifebox 50GB, lifecell Magazines, go to the website s.lifecell.ua/bomb. To activate PREMIUM subscriptions, order the PREMIUM service at first, pay for it – 50 UAH (including all taxes and fees) and order all the desired subscriptions fizy Premium, TV+Cinema+Premium 30 and lifebox 500GB on the website s.lifecell.ua/bomb or via “My lifecell” mobile app. To download applications, go to the website s.lifecell.ua/bomb, under the application description there are buttons for download on App Store or Google Play. How to find out what subscriptions are already ordered? Dial *112# from the mobile phone, or via My lifecell app in the section “My services”. How to deactivate subscriptions or PREMIUM service? To deactivate Basic or Premium subscriptions, as well the PREMIUM service, dial *112# from the mobile phone. Please note! Deactivation of ALL Premium subscriptions is only available after PREMIUM service deactivation. Is data saved while subscription deactivation? If you change or deactivate the subscriptions, your saved data in the apps are automatically deleted. Please, take care of keeping your data by using backup copy option. Is there are any limitation per day/month while changing the type of subscription? You may change the type of subscription during a 30-day service package validity as many times as you wish, but no more than 1 time per day. Are the subscriptions kept while switching to any other tariff plan? When switching to any other tariff plan, ALL subscriptions are automatically deleted. Take care of keeping your data by using backup copy option. How to restore/find out login or TV+ password? Send SMS to a short number 225 (for free) and get SMS with login and password. 1The package of 100 SMS is provided, which is valid till end of day (by Kyiv time). Since 101 SMS per day, every SMS will cost 1 UAH. 2In case of expenditure of all 100 SMS provided for the day, the cost of every sent SMS is 1 UAH. The tariffs are valid within Ukraine. Providing telecommunication services on temporarily occupied territories and territories beyond the control can be limited or impossible due to the circumstance beyond mobile operator's influence and control. This tariff plan is launched on 01.06.2018. The minimum tariff plan duration is 7 days from the date of its activation. The tariff plan terms are valid as of 14.02.2019. By activatinga lifecell SIM card, the subscriber confirms that she/he reads and agrees to the Terms and Procedure of Telecommunication Services Provided by lifecell LLC, how to use the chosen tariff plan, has gotten all the required, available and reliable information about telecommunications services, their quantity, quality, range, as well as their provider (seller). lifecell LLC reserves its right to suspend providing of bonuses/to cancel the bonus account unilaterally without the consent of the user when such user violates the laws of Ukraine. Get 1 GB of 3G Internet for 29 UAH/30 days!